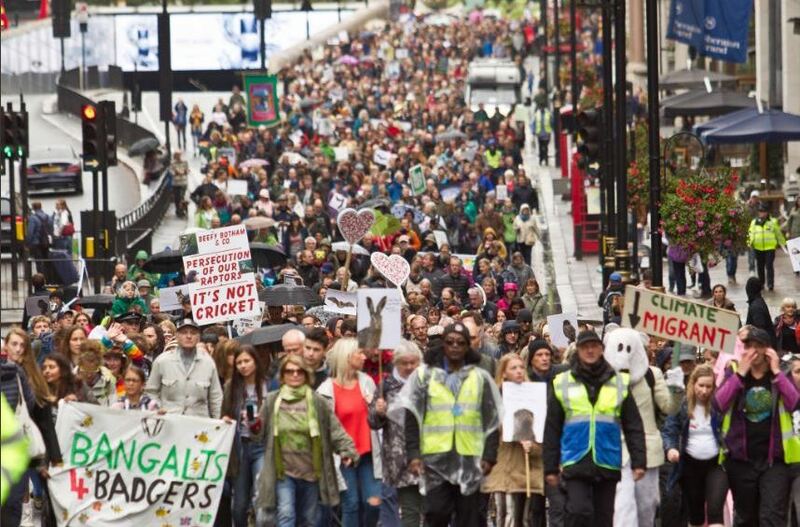 If you were one of the 10,000 people who walked through London on Saturday, soaked but happy, you were acting politically. You were using your freedom of speech in a democracy to call on your government to do more for wildlife. And thank you for doing so – your action, combined with those of thousands of others, has certainly been noticed. But don’t stop there please. And if you wished you could have been one of the #soddententhousand then there is a very simply action you can take to be a part of the movement for wildlife. Please write to your MP. It’s as simple as that. If a flood of letters and emails head to Westminster (and Cardiff, Edinburgh and Belfast) over the next few days then we will wake politicians out of their complacency. I’ve written to my MP (see here) but you can do much better. You don’t have to be an expert, you just have to point your MP towards the Manifesto for Wildlife and ask them what they are going to do to help wildlife. Here is how you find out who is your MP. Here is how you find their address – you can write either to Westminster or to their constituency. Writing is the best option (email or letter) and keep a copy of your letter because by the time you get a response you may have forgotten what you said! You must give your name and address to confirm that you really are a constituent otherwise the MP may ignore your letter. Please don’t think ‘I expect someone cleverer than me will do it’ because a) they may be thinking the same, b) it’s not about cleverness it’s about showing that you care and c) two letters are more than twice as good as one letter. So your letter counts. I’d be interested to know if you do write to your MP – I wonder how many we can reach. And I’d be interested in seeing the replies you get – I wonder what they will all say. Come on! This is easier and cheaper than going to London! Take the next step on the Walk for Wildlife and write to your MP. And your MP won’t have any excuse to be ignorant – over the next few days they will get a copy of the Manifesto for Wildlife in the post. Your letter can ensure that they read it and respond. I'll let you know how I get on with a reply Chole Smith Norwich North is my MP. I've written to my MP, Royston Smith, Southampton Itchen. Waiting for a reply! Sarah - thank you. It’ll probably be at least a couple of weeks before you get a reply. I emailed my MP (David Drew- Labour -Stroud) on the train home from the walk and got a reply within a few hours that night! Thank you for your email. Unfortunately I only got back from leading a Parliamentary delegation to the Sudan in the middle of last night and had a Surgery all morning and so it was impossible for me to get there. I’m glad you went as I’m one of the Defra Spokespersons on the Opposition Front Bench and we will be highlighting protection of wildlife in the forthcoming Agriculture Bill. As such I fully support Chris’ initiative. I hope that you enjoyed today - a very worthwhile experience. Labour are, at least according to the NFU and farming press, cosying up to the farming unions. This may be just wishful thinking on the part of the NFU, it may be not. If Labour are doing this, then any suggestions that they are going to be strengthening the protection of wildlife from intensive agriculture as the Agriculture Bill passes through Parliament, must be treated with a great degree of scepticism. I've emailed my MP, who is Sir Oliver Letwin. He normally gives me a reasonably considered reply. I will let you know what he says Mark. But it could be a while before he is in a position to do so, with the Conference coming up. Tim Farron - Lib Dem spokesperson for environment, food, rural affairs contacted 3 days ago - nothing as yet. And he usually does reply quite quickly...but not this time. James - 3 days would be mega-quick! My guesstimate would be a couple of weeks on average. Thank you for writing. I have also written to my MP, Luke Pollard, Plymouth Sutton & Devonport (Labour) regarding the People's Manifesto for Wildlife. Luke is also in the Shadow DEFRA team. I also asked him to sign Early Day Motion 313 regarding hunting on National Trust land. I was one of the happy but sodden 10,000 and travelled up from Devon on the train. Unfortunately we were delayed when the train couldn't get any traction on the tracks (those Devon hills!) so I was refunded my fare. Will donate it to the crowdfunder. A momentous day and a turning point. Thank you. Sophia - many thanks for writing. We'll see what he comes up with. Will be interesting. Mark - I emailed my MP Hugo Swire a few days ago, forwarding the Manifesto. Awaiting a reply. Happy to have been amongst the #soddententhousand. I feel this is very important and I will get emailing my MP, Susan Elan Jones. She is usually very supportive on wildlife issues, so I am hopeful that she will lend her support. Mark - I have emailed my MP Mel Stride (Central Devon) today with a link to the Manifesto. I'm so glad I was one of the #soddententhousand. Sally - I am glad you were too! Thank you for writing to your MP. Another letter to an MP has been sent, to my MP, John Healey, Labour party (Shadow Secretary for Housing). I am passionate about wildlife and the natural world, and I try my best to contribute in anyway I can in protecting and enhancing it in my local area and elsewhere in the UK and abroad. I am a big admirer of Chris Packham and his recent campaign to get a manifesto for wildlife put into law. To give the protections to the natural world that has faced an onslaught in the preceding decades and now. This being said, if you have not do not so already, I would be grateful if you to read his manifest, and comment on the actions you will be taking as a member of parliament to lobby for the protections the natural world so sorely needs at the moment, both in the 'your' area and the UK in general. Here is a template if anyone wants to use it. Use the website below to get your local mp and copy and paste in the field once you have clicked on your local mp in the website. I am passionate about wildlife and the natural world, and I try my best to contribute in anyway I can in protecting and enhancing it in my local area and elsewhere in the UK and abroad. I am a big admirer of Chris Packham and his recent campaign to get a manifesto for wildlife put into law. To give the protections to the natural world, that has faced an onslaught in the preceding decades and now. This being said, if you have not do not so already, I would be grateful if you could read his manifest, and comment on the actions you will be taking as a member of parliament to lobby for the protections the natural world so sorely needs at the moment, both in the 'writeyourarea' area and the UK in general.